Spire Corporation’s Spire Solar unit builds turnkey factory assembly lines for crystalline and thin-film photovoltaic (PV) factories. 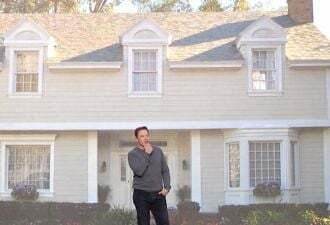 Roger Little, Spire’s CEO, is looking pretty smart right now. Since early this spring, Little has been predicting a tariff in the 30 percent range would be put on Chinese solar panel imports. On May 17, the U.S. Department of Commerce imposed a 31 percent tariff on panels from China’s biggest panel makers. U.S. solar manufacturers have been struggling against low-price panels from China. The tariff is intended to prevent what domestic trade groups have described as “dumping” by the Chinese of below-production-cost products. Chinese panel makers are attempting to unload excess inventory even though they are being forced to do so at a loss. There are two parts to the Commerce Department tariff, one punitive and one preventative. The 61 Chinese companies identified with the dumping will be required to pay the 31 percent tariff. To prevent those companies from shipping into the U.S. under a false front, Chinese panel makers who have not been exporting to the U.S. will be required to pay a 250 percent tariff if they begin doing so. Some say Chinese manufacturers are likely to get around the tariffs by using a non-Chinese false front. Others fear China will counter-accuse U.S. polysilicon manufacturers of unfair practices before the World Trade Organization. Media reports say Chinese solar company stock prices fell with the Commerce Department announcement while U.S. panel makers’ share prices rose. 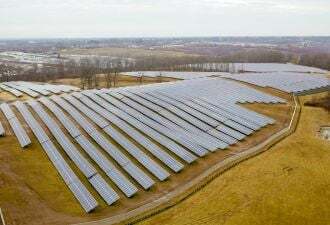 “From a broad view,” Little recently told GTM, referencing data that put the U.S. imported price of a Chinese module at 94 cents per watt, “a tariff would not be good for the industry because it would likely result in higher-priced modules.” But, as with the cost of Spire’s turnkey facilities, Little said, variables make all the difference. In the same assessment from which he got the 94 cents per watt Chinese module price, Little found that U.S. manufacturers would require a 31 percent tariff if they were to import Chinese wafers to manufacture modules. 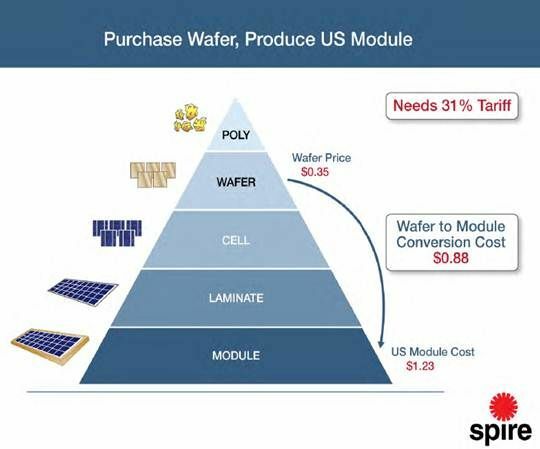 The wafer price would be 35 cents, the wafer to module conversion cost would be 88 cents and the U.S.-made module would cost $1.23. Domestic manufacturers would, however, only need a 14 percent tariff if they were to import Chinese solar cells at 53 cents to make modules. The cell-to-module conversion would cost 54 cents, making the cost of a U.S. module $1.07. 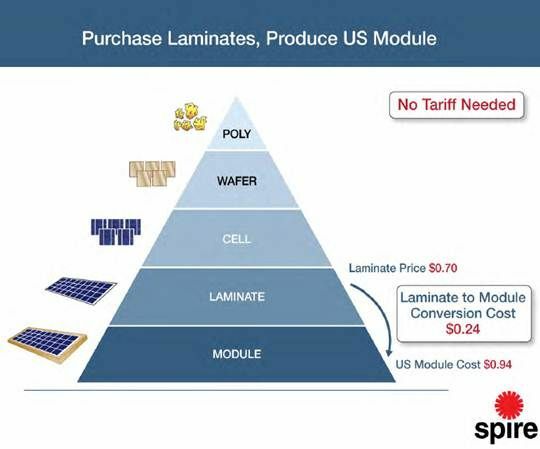 And, Little found, if a U.S. manufacturer were to import laminates at 70 cents, a laminate-to-module conversion cost of 24 cents would make the price of a U.S. module cost 94 cents and no tariff would be needed. Spire offers turnkey assembly lines that perform all three of those manufacturing processes. Spire, Little said, will continue to thrive despite the tariff. 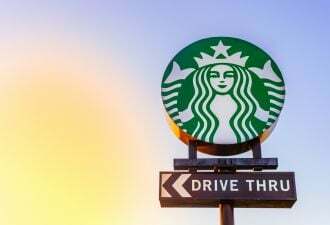 They have customers all over the world. They rode the Chinese expansion of the last few years very successfully and have turned their attentions more recently to India, where a 20,000-megawatt solar target, incentive programs and an entrepreneurial inclination are sparking a major expansion. His company has also recently done business in such disparate and expanding markets as Ethiopia, Turkey and Romania. “We know what’s going on all over the world,” Little acknowledged. He had no fear of a backlash or a trade war from the tariff but, in fact, saw it as an opportunity. Germany-based SolarWorld and Japan-based Sharp, which according to Little dominate the U.S. crystalline silicon PV market, obtain their manufacturing equipment in their home markets. Spire, Little said, therefore has no chance to win their business. 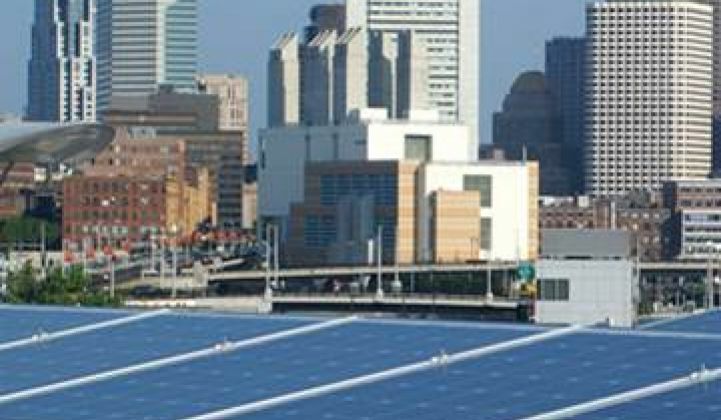 Ultimately, Little said, the real problem will come if the tariff impedes the advance of the levelized cost of solar energy-generated electricity in the U.S. and around the world toward grid parity.